Customize me! asks for a change and flexibility. Space is not enough anymore, time needs to be linked to space. We would like to offer a house that suits several moments in life and all kind of standards of living. Moreover we would like to offer space for own input, for all kind of people, independently from their origin, social status or age. Our site, 4.100 m2, is situated in a green area and is part of a development plan to transform the whole neighbourhood into a qualitative living area. Our aim is to create a dynamic public space and to guarantee a private outside space for every dwelling. 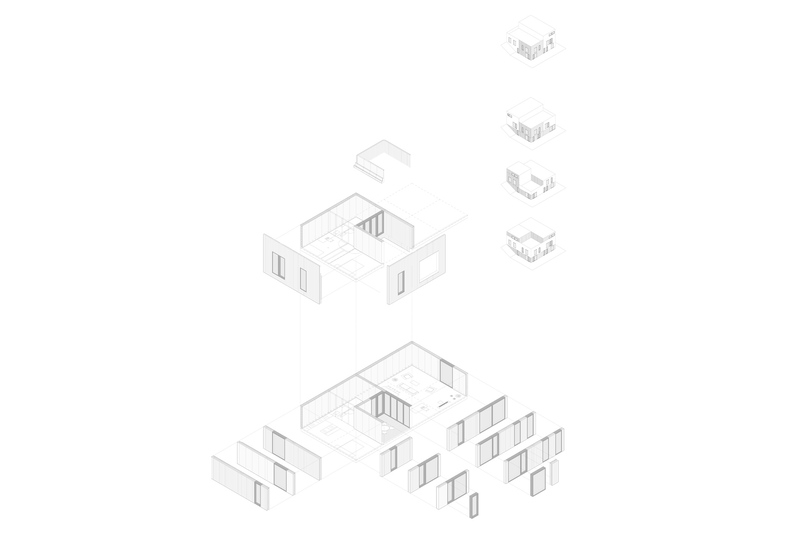 In order to achieve this, we propose a very compact solution wherein every house has direct access to the public space. The entrances are located along the whole site, which provides movement and interaction. By placing the accesses in two levels, the parking remains hidden from the view. Private outside space: We provide every house with the possibility of a roof garden, small front yard and a inner patio. 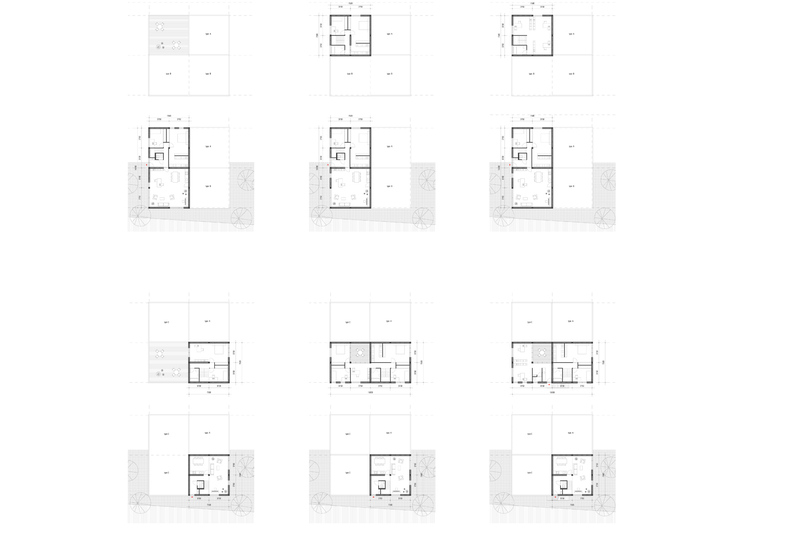 Arrangement | Every block contains three houses, every house consists of three modules of 50m2 (7.5 x 7.5 x 3 m). 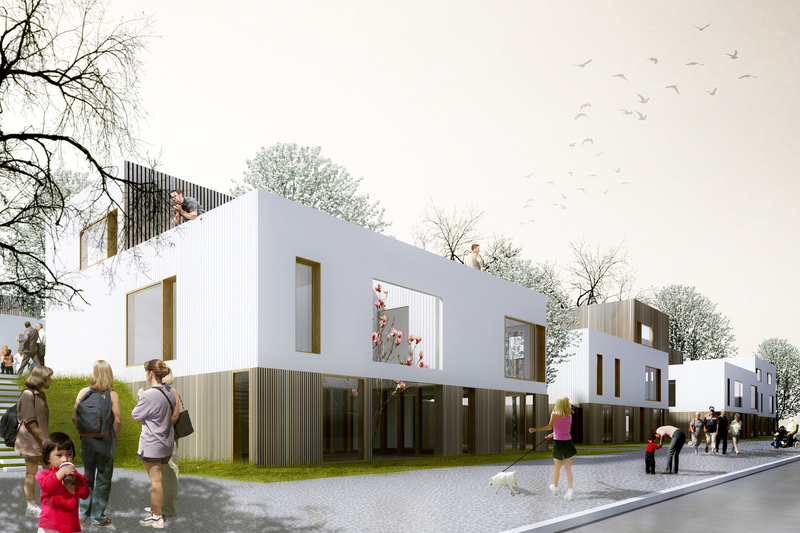 By making a very compact block we could offer high quality houses: Every house has the possibility of a wide floor (100m2), a roof terrace, a small front garden, two parking spaces out of sight and good orientation. The starting point (as required in the design brief) is a house of 100m2 that could grow up to 150m2 and srink back to 100m2.